This month, as wedding bells ring for hordes of happy, hopeful newlyweds, my husband and I are celebrating our 29th anniversary. We’ve learned a lot over the years, and we wish all the new kids on the block as much happiness and good fortune as we’ve enjoyed. We especially wish them the will and wisdom to talk openly, honestly, and lovingly about money. How important is money talk? Very. When asked to name the biggest problem area in their relationship, more couples cite fighting about money than any other subject. Money is, indeed, a touchy subject. Everyone has an emotional relationship with money that starts long before they’re old enough to say, “I do.” Couples who don’t explore their individual money styles, habits, and foibles—and share them with love and compassion—soon find themselves on thin ice. 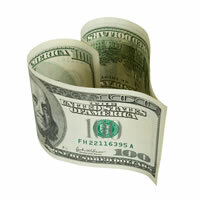 Getting together on the subject of money is vital for a happy, healthy marriage. Both partners need to feel confident and comfortable in dealing with financial matters. Marriage is teamwork, and partners need to trust and support one another while they work to build a secure and prosperous future. Decide together what you want. Talk about your financial priorities. What are your hopes and dreams? When you disagree, step back and try to understand your partner’s point of view. Establish your goals, short and long term, then list the steps you need to take to achieve them. Balance the financial power in your relationship. Discuss the roles that each of you will play in earning, managing, and spending money. However you divvy up the financial duties, make sure you review your finances together and both know how to carry out all the necessary tasks. Talk about how you feel in the roles you choose. Work together to develop financial knowledge and money management skills. If either of you lacks knowledge about money matters, make the effort to master the basics and boost your confidence. Both of you should have a clear idea of how you earn, spend, and save your money. Accept your own imperfections and your partner’s, too. Don’t try to change the past, spend the same money twice, or make your partner into a different person. Fortunately, in most situations, there are lots of right money decisions and very few really wrong ones. Compassion, understanding, honesty, and trust will help you create a happy financial partnership. Keep an open mind and an open heart when you and your honey talk about money. Love knows how to listen!